Every year during the first week of March, hundreds of school children across the province welcome farmers and agricultural professionals into their classrooms to celebrate Canadian Agriculture Literacy Week. 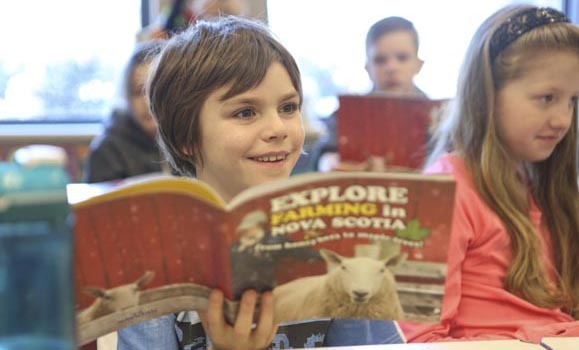 During Agriculture Literacy Week in Nova Scotia, volunteers give their time to bring agriculture to life for grade four students by reading from a book about farming in the province. These visits give students, most of whom are two or three generations removed from the farm, a chance to connect with farmers and better understand the importance of agriculture in their daily lives. Agriculture Literacy Week is a national initiative of Agriculture in the Classroom Canada (AITC-Canada), a non-profit organization with a mission to enhance the knowledge, understanding and appreciation of agriculture in everyday life. AITC-Canada has partnered with founding sponsor Farm Credit Canada to offer the program since 2012. The inspiration, however, came from Nova Scotia. Nova Scotia has been celebrating Agriculture Literacy Week since 2008, when it was first proposed by the Agricultural Awareness Committee based on a model being used in the US. The committee, which is a partnership of government, industry and rural organizations, leads development and implementation of agricultural awareness initiatives within the province. This year, AITC-Canada member organizations in seven provinces will deliver and celebrate Canadian Agriculture Literacy Week. Classroom visits start but are not limited to the first week of March. Readers are encouraged to visit schools until June and activities beyond classroom visits are also planned. In that spirit, students from the Faculty of Agriculture will host an afternoon of agriculture-related activities with youth from HRM at the Halifax Central Library on March 12 from 2-3:30 p.m.
During typical school visits, the reader is equipped with the book Explore Farming in Nova Scotia, but there is no script for the visit. Volunteers are encouraged to tap into their unique expertise and use other resources to enhance their visit, such as videos or props from their own operations. The book is left in classrooms along with follow-up activities and resources designed to help teachers and students further explore the science and culture of farming in Nova Scotia.